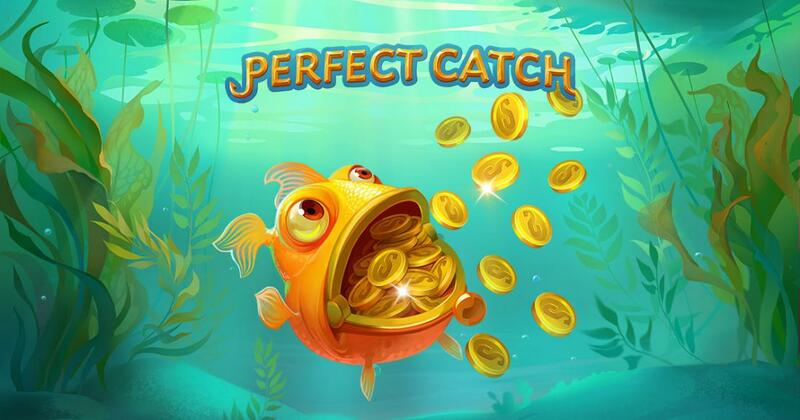 Sthlm Gaming is responsible for the release of Perfect Catch, a slot with fishing themed graphics and a 96.32% RTP. I’ve seen enough fishing themed slot machines already, to know that Perfect Catch is one of the best designs to appear in this category. Sthlm Gaming is the company that released it, and I like how well the graphics are made. Before we move on to the slot’s features and the rest of its offer, it’s worth taking a minute to check out the highly appealing design. The action takes place in a pond, with plenty of vegetation visible from your position at the bottom, and with a boat floating lazily at the top. The reels are submerged, and they have various objects and creatures that you might find in the water. For the proper symbols, you have images of frogs, crabs, old shoes, fish cans, but also fish weighing scales, blue fish, yellow fish, red fish and a Wild logo. Even the Royals though, which are typically the boring symbols of any slot, will be made out of metal and will be shaped as fishing hooks. Overall, I’m really impressed with the design style and quality of the symbols. A 20 line slot, with 5 reels that will spin, Perfect Catch comes with a 96.32% RTP and it can pay a jackpot of 2,500x the stake (before wild multipliers are applied). You will encounter scatters, free spins, three types of wild symbols and multipliers, so there will be enough to keep you busy inside. As with most slots, the bet selection is done from a single place, where you pick the total amount. The extremes of the range for this one are $0.20 for the lowest and $100 for the highest setting. Some of the bonuses offered in this game come via fish symbols, which can appear on the middle three columns. Red Fish is used as a wild, with a 2x to 5x multiplier, and the option to have several contributing to a win and adding their multipliers together. Yellow Fish gives you one extra win of up to 25x the stake, plus it turns into a wild next. Blue Fish adds 1-2 additional wilds on its reel and then it also transforms into a wild. Finally, the slot has free spins, anywhere from 8 to 30, which trigger via dedicated scatters. Impressive graphics, good features, a good RTP, Perfect Catch offers its players quite a bit, and it’s a slot that fans of fishing shouldn’t miss out on. Try of out a demo version of Perfect Catch.